Welcome to the Affiliate Marketing Books Library ! Now I’ve read all of these affiliate marketing books and I can highly recommend them. While they are in no particular order I would start with the DotComSecrets Book by Russell Brunson. 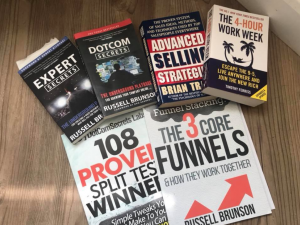 It was one of the first books I read out of the ones listed below and I have to say it’s still the one that’s made the most difference to my life and to my business. It’s important to always keep up your learning as you go and if possible set aside at least 30 minutes a day to continue updating your knowledge and skills. Click on any of the titles below for a more in depth review.